Florence Bloomberg, age 91, of Boone and the Westhaven Community, died Monday, October 29, 2018 at the home. A Funeral Mass will be Monday, November 5, 2018 at 11:00 a.m., at the Church of the Sacred Heart in Boone. Burial will be held at Mineral Ridge Cemetery, Ridgeport, Iowa. Florence Maryann (Jarosz) Bloomberg was born in Chicago, Illinois on September 4, 1927, the daughter of Thomas and Marianna ‘Mary’ (Bozek) Jarosz. She was united in marriage to John Clarence Bloomberg on September 10, 1949 in Chicago, Illinois. To this union three children were born, Harold, Jackie and Chris. Florence was a homemaker for her family. She was a member of the Church of the Sacred Heart in Boone, was a 4H leader and was the Dodge Township Clerk. 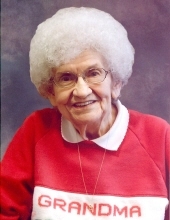 She enjoyed gardening, crocheting and doing crossword puzzles. She is preceded in death by her husband, John on March 6, 1980; her parents; a son-in-law, Garry Flickinger; six brothers; one sister; numerous in-laws, nieces and nephews. Florence is survived by her three children, Harold Bloomberg and his wife, Dorine, of Ogden, Jackie Heggen and her husband, Ed, of Fort Dodge, Iowa and Chris ‘Tina’ Flickinger of Elk River, Minnesota; six grandchildren, John Bloomberg and his significant other, Hally Cohen, of Santa Monica, California, Jenny Milller and her husband, Jason, of Ogden, Erik Heggen and his wife, Nicole, of Westmont, Illinois, Amanda Flickinger of Princeton, Minnesota, Rebecca Nelson and her husband, Luke, of Big Lake, Minnesota and Meredith Flickinger of Elk River, Minnesota; three great-grandchildren, Brayden and Gavin Miller and Drew Heggen; three sisters-in-law, Della Jarosz, Ruth Williams of Maxwell and Karen Carney of Maxwell. Friends may call at the Schroeder-Reimers Memorial Chapel on Sunday, November 4, 2018, from 2 until 4 p.m. where the family will be present at that time. There will be a rosary held at 1:30 p.m. before the visitation at the Chapel. In memory of Florence, memorials may be directed to the family. To send flowers or a remembrance gift to the family of Florence Bloomberg, please visit our Tribute Store. There will be a rosary at 1:30 at the chapel. "Email Address" would like to share the life celebration of Florence Bloomberg. Click on the "link" to go to share a favorite memory or leave a condolence message for the family.